My father’s quarter acre garden was a riot of colour: snap dragons, sweet smelling stock and bunches of golden jonquils springing up everywhere. The perfume was exquisite. 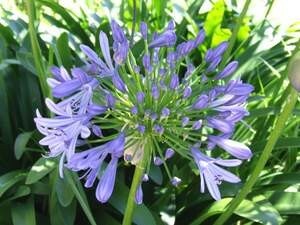 Agapanthus, however, outnumbered these sweetly scented flowers by multiplying like the proverbial rabbit in the shade off the garage and three huge prunus trees, one baby pink, one crimson and one white, butchered to a stalk come every winter. However, they release their vibrancy every spring, bursting into maroon leaves and frilly blossoms, which carpeted the buffalo lawn, mown with army precision, before work twice a week by my father. A variegated pittosporum grew elliptically against the mauve painted garage; a crepe myrtle displayed its smooth spotty bark in winter, when offered as a sacrifice to the gods of pruning! It sprouted two metres in autumn, bursting with crimson buds in military rows on every branch. Pink camellias grew tall on excess effluent of the early 60s, long before the joy of sewerage arrived in western suburban Revesby. This created a carpet of bright pink petals beneath their glossy trunks, looking quite like an explosion of oversized pink confetti. A row of standard red roses standing at attention, with miniature tea roses at their bases, flanked our driveway. At a cost of $4 each in 1957, they were carefully planted while my mother quietly laboured away with her second child – me! When a car collected out corner wiping out the dividing fence, my father angrily berated the driver over the cost of replacing them! This quarter-acre garden was juxtaposed against my nan’s greenhouse fernery and my poppa’s frangipani in sandy Maroubra. My allotted patch was half a metre square, made up of succulents in clay pots baking in the scorching westerly sun. My nine-year-old self toyed with them and several unnamed plants in dull pots, watching and observing, though few things ever happened within my little potted patch. Leaving childhood, I grew up got married and bought my own quarter-acre block, still in Revesby. Surrounding our 50s fibro home was once a show garden that had descended into weeds, wandering Jew and concrete. Long, child-free weekends brought it back to life and it grew like topsy, as we added diosma, frangipani, gardenias and fuchsias to its camellias and azaleas. It is now in its 35th year and I always manage to squeeze in “just one more pot from garden club”. The begonias and geraniums wave at me, as I teach from home, beckoning me outside to admire their bright, scentless flowers. Yet, I cannot help wanting to share my little piece of paradise by giving more….than just one. Alison Miller is a teacher whose love of words has led her to write for as long as she can remember. She has been published both online and in print and has won several awards for both poetry and prose. Alison’s interests include travelling and gardening and she indulges the latter in her quarter-acre garden in the Sydney suburb of Revesby, where she lives and where she raised her two grown-up daughters.